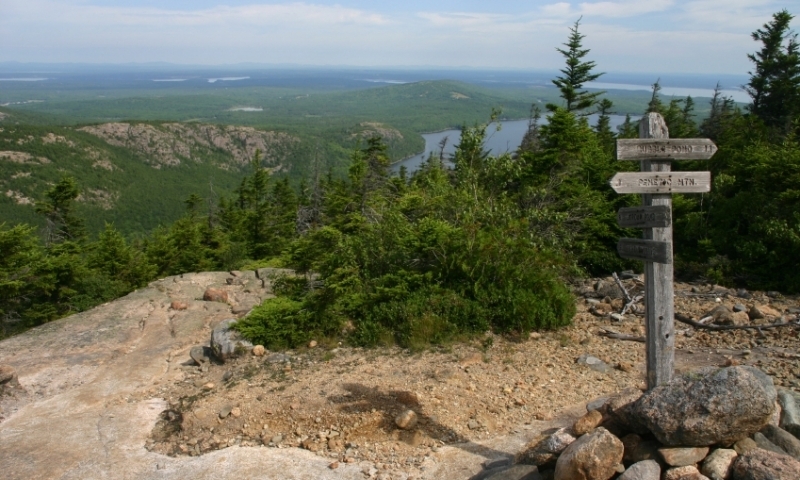 At 1234’ above sea level, Pemetic Mountain is the fourth highest peak in Acadia National Park. A moderately strenuous hike leads to 360-degree panoramic views of forests, mountains, and ocean. To reach the trailhead from Bar Harbor, travelers go north on Route 3 to the Park visitor’s center at Hull’s Cove. There the park service road leaves Route 3 heading towards Bubble Pond and the Pemetic Mountain trailhead. The trail starts near the parking area at the north shore of Bubble Pond. The trail to Pemetic Mountain is open year-round unless closed by the Park Service due to unsafe conditions. Ice in winter and early spring can make the rocks very slippery. The hike to Pemetic Mountain climbs steadily through dense evergreen forests before reaching craggy outcrops and breathtaking sweeping views. The dramatic scenery inspires visiting photographers, while the open granite ledges of the summit lend themselves to exploring. Outlooks and outcrops provide great places for resting and eating lunch. The 2-¼-mile hike takes 2-3 hours roundtrip.